On the northern coast of California is Humboldt Redwood State Park, a 50,000-plus acre expanse which is home to many of the tallest trees in the world. It is also home to the tree pictured above, which, you’ll notice, has a lot of white foliage. That’s rare for a tree, to say the least, in no small part because trees require chlorophyll in order to produce energy via photosynthesis — and chlorophyll makes leaves green. In theory, therefore, the tree above shouldn’t be able to survive. In reality? It’s very much real — and thriving. That tree and those like it are called “albino redwoods” — a misnomer of sorts, because “albino” refers to a lack of melanin (not chlorophyll) — but one gets the idea. There are about 25 known to exist, per NPR, and other reports say there are as many as 50-60 in the wild, with about eight in Humboldt itself. Due to the rarity, they are hard to study — but not impossible. For example, while we don’t know how the genetic mutation happens, how these trees survive is well understood. They steal resources from other trees. The redwood forests like the one in Humboldt are home to many, many very tall trees — trees which tend to soak up much of the available sunlight while casting tall shadows onto the ground below. Smaller redwoods in these forests — albino or otherwise — therefore compete for a very limited amount of sunlight and need to find another source of what is, effectively, nourishment. To do so, as the San Francisco Chronicle explained, these trees “weave their root systems into that of other redwoods and tap into their food supply,” giving their neighbors a subterranean vampiric kiss of sorts. This is a trait rare in the tree world — most other types of trees can’t simply connect up like redwoods can. For the typical redwood sapling, this ability is the difference between surviving and perhaps thriving — they’re likely to find enough sun (and water) to get by regardless, but this fallback system of interconnectivity helps. For the albino redwoods, though, this is their only means of survival. If you want to see one in person — well, that’s tricky. They are so rare that officials at Humboldt restrict access to the tree above, of course. But they go one step further. In order to protect it from human interference, officials do not even publish details of its location, according to this report from TV station KQED. 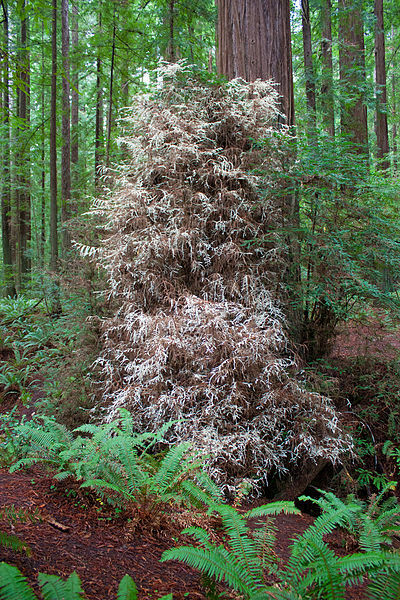 Bonus Fact: Some of these albino redwoods don’t just weave themselves into their neighbors — they become part of the tree they’ve invaded. These trees, called chimeric albino redwoods, have two sets of DNA, one from each tree, and are often be-speckled with whitish, yellowish foliage among a majority amount of green leaves. They’re also very rare and may become even rarer. One such specimen, located in Cotati, California (about 45 miles north of San Francisco), is scheduled to be uprooted to make way for a new set of train tracks. From the Archives: The Chimera: While rare, people can have two sets of DNA, too. Related: A “nicely started California redwood tree — 21 inches high.” Okay.